As more and more of our customers send and receive emails on multiple devices, it’s good to know you have options when it comes to email configurations. You’ll find that Outlook and other email clients support two protocols: POP3 and IMAP. Here’s a little bit of information about each that will help you decide which configuration suits you and your needs best. This protocol downloads messages from the user’s Inbox folder and saves them to a local data file in the mail client. When download is complete, the messages are deleted from the server, although most mail clients allow you to leave messages on the server for a specific amount of time. 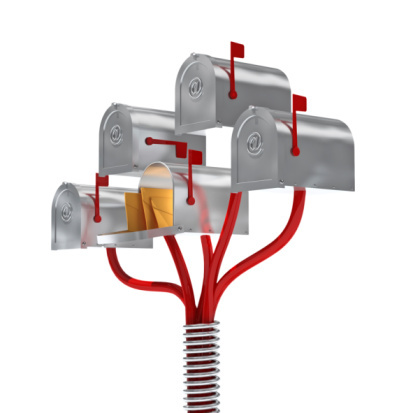 This configuration is recommended if you’d like to keep your email messages for a long time, because you don’t have to worry about your mailbox on the server filling up typically. This protocol synchronizes your mail client’s folders with the server. Messages are stored both on your email client as well as the server. If you’d like to keep email for a long time without worrying about your mailbox on the server filing up, you’ll need to move messages into archive folders in your mail client program. One great feature of IMAP is that it is a synchronization protocol. If you have your email account configured on multiple devices, the read/unread status of messages is maintained, so you get a consistent view into your email. If you are going to use IMAP with multiple devices, ALL devices should be configured for IMAP. With either option, it’s strongly recommended that you use/enable SSL or TLS, which encrypts the email session. Using / enabling SSL or TLS as an alternate port for sending mail keeps your session (and passwords) more secure – another strong recommendation. In addition, the user of an alternate port helps to work around widespread blocks on port 25. If we host your email accounts and you’d like help sorting out which to use, have questions about setup, etc., send a message using the form below. I’ll have one of my technical support team members get right back to you. I’d like to thank my Network Administrator for his knowledge regarding email configurations provided for this post. Cindy Spencer, an Account Manager at NetSource Media since 2000, works with clients across the US with RVUSA.com, TrailersUSA.com and RVCanada.com. Cindy and her in-house team of designers and programmers helps dealers with website design & hosting, inventory management & distribution, website maintenance & SEO and much more. Connect with Cindy on Google+.